Works of art can have the power to make us see a new reality. One of the greatest painters of the Baroque age, Andrea del Pozzo, became a master at creating the illusion of a different reality, through his famous trompe-l’oeil frescoes. 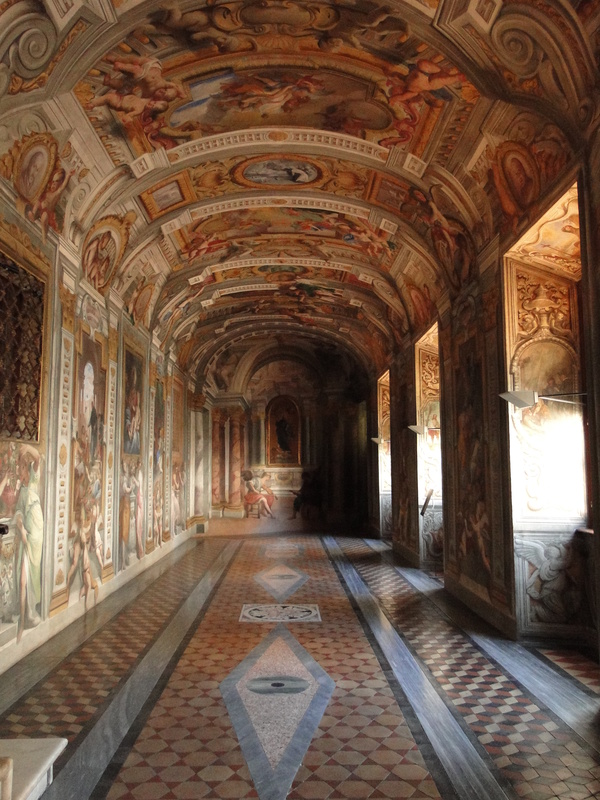 He is best known for painting the fake cupola inside the church of St Ignazio in central Rome (see previous posts), but the more modest corridor he painted in St Ignazio’s rooms, next to the nearby church del Gesù, leaves a more powerful impression. On an ordinary vault, he created an architectural construction of pillars, straight angles and relief curves, using his amazing technique of anamorphic painting. Andrea del Pozzo was born in Trento (north-east Italy) in 1642 (so more than 40 years after Bernini and Borromini). 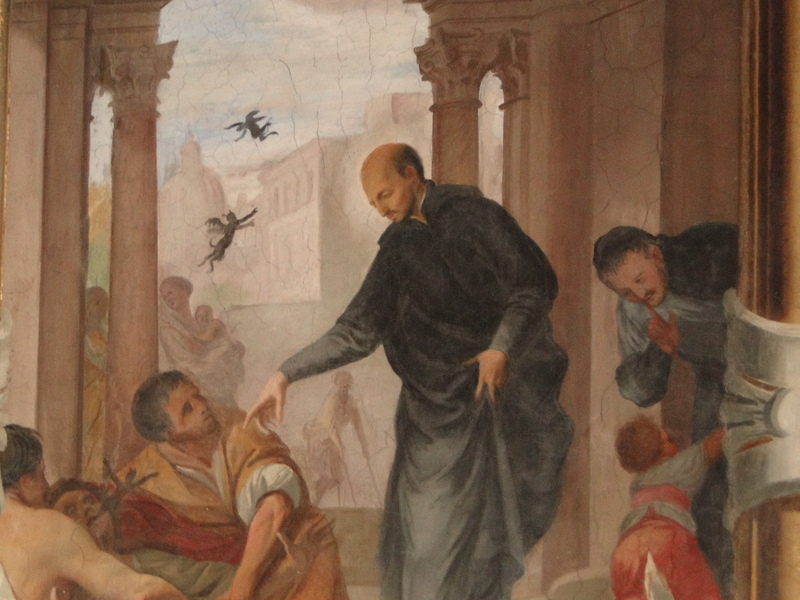 In his early twenties, he joined the Company of Jesus in Milan, but continued to work as a painter, decorating many of the Jesuits’ churches. 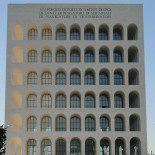 His work got noticed, and he was soon called to the headquarters of the Company in Rome, to decorate the former rooms of its founder, Ignazio de Loyola. Loyola had created the Company in 1534 in Paris, and in 1540 it was officially recognised as a religious organisation by Pope Paul III (Farnese). The Company grew very fast and became instrumental in the Catholic Counter-Reformation which dominated the 16th century. The De Loyola, originally from Spain, settled in Rome, in the Casa Professa, the building adjacent to the Church del Gesù, from where he ran his very ascetic and hierarchical organisation. After his death in 1556 (in the Casa Professa), the building was restructured but his rooms were left as they were when he lived there. They have now become a little museum showing with relics and objects which belonged to him (he was canonised in 1622). 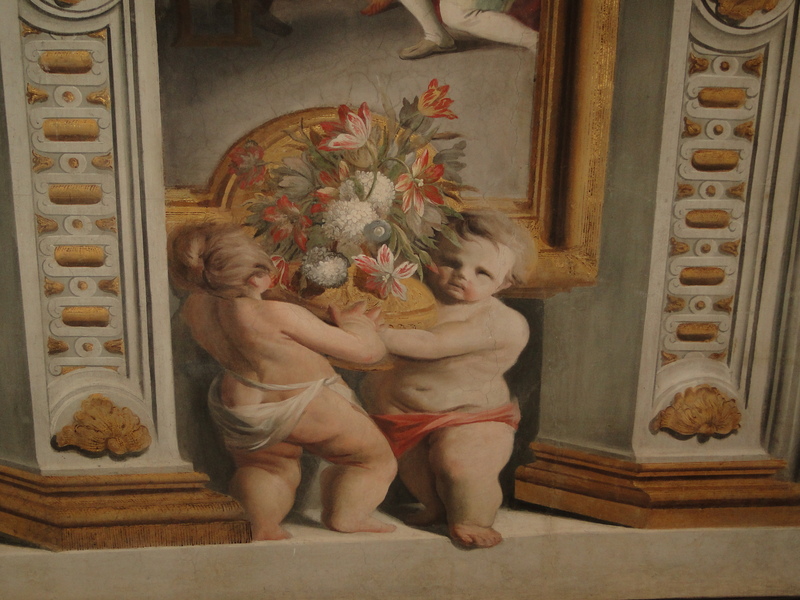 Being a Jesuit himself with already a name as a painter, Andrea del Pozzo was the first choice to decorate the corridor leading to the rooms and celebrate the life and achievements of St Ignazio. The subject matter was very close to his heart, and through it, he managed to take his art to new heights. The room was quite a challenge to enhance with its relatively narrow dimension and oblique wall at the back. Del Pozzo used all his talent to transform it into a grand yet intimate space. 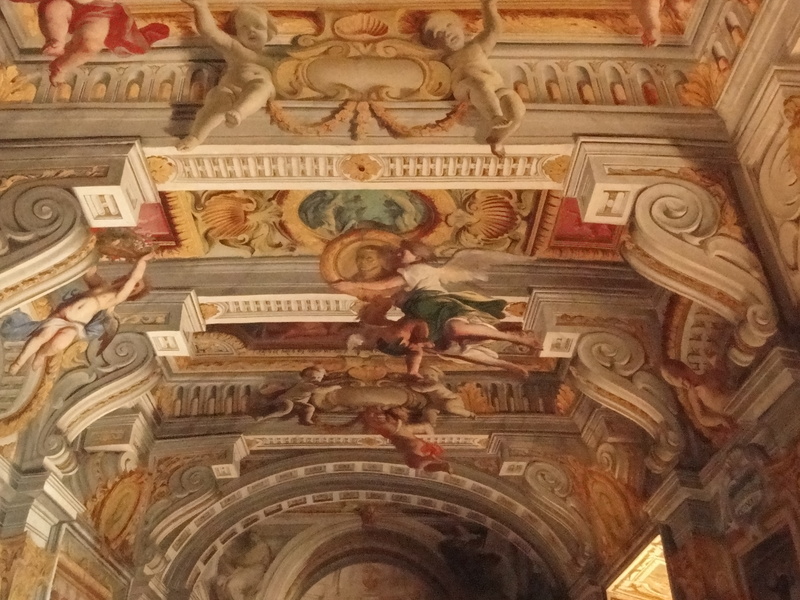 Looking at the many painted features on the ceiling and walls becomes a game of optical illusion. In the course of his career as an artist, del Pozzo also wrote a famous Treatise on Prospective, which became a reference for many of contemporaries. The rooms can be visited every week day from 16.00 to 18.00 hours, free of charge. Very few visitors make it there, as they concentrate on the actual Church del Gesù and the church of St Ignazio, on the other side of the former Jesuit College, known as Collegio Romano (today part of the Gregorian University). So having the place for oneself makes the experience even more enjoyable! Thank you so much for this post. I’ve been looking so long for detailed information about this hidden marvel. Andrea Pozzo is a genius. Can’t wait to see this masterwork with my own eyes. 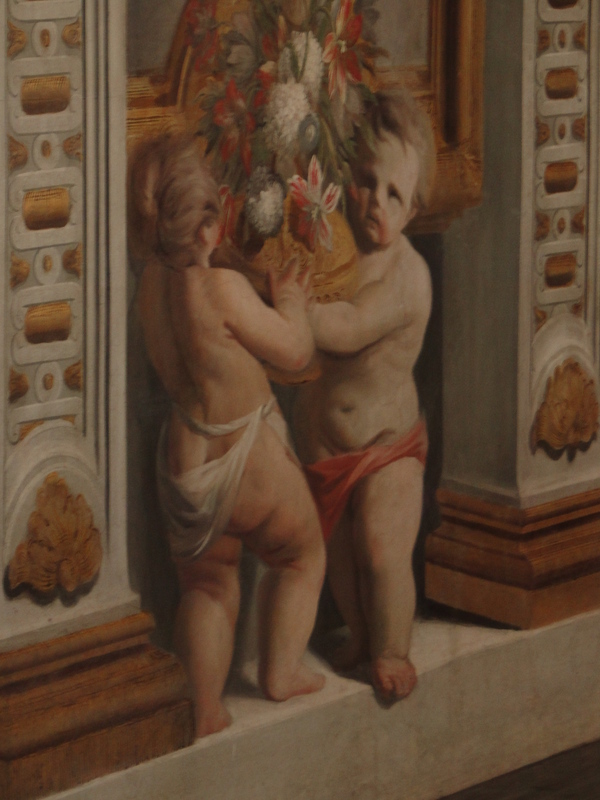 This entry was posted on September 21, 2010 by Salambo in Arts and culture, Baroque Rome, churches, English, Roman artists and tagged Andrea del Pozzo, baroque, church, church del Gesu, ignacio de loyola, Ignacio's rooms, jesuit, Rome, rooms, trompe-l'oeil.